I Had the Best Dentist Ever For 30 Years. Really? What prompted me to write today’s blog is actually a unique case of a walk-in patient who came into my practice wanting some pain relief on a Friday night. It’s a policy of Healthy Smiles Dental Group, one of its cornerstones in fact, that we never turn away anyone in pain. If you ring up the practice we’ll definitely see you, even if it means staying back after 5 pm on a Friday evening. Let’s call this patient John Smith. Well, John walks into my practice on a Friday night in a bit of pain. Before he’s even filled out his New Patient form his first statement is, “Everything’s perfect in my mouth, I’ve been with my previous dentist for the past 30 years.” He then goes on to tell me about how his old dentist never charged him excessively like “all other dentists”, always patched him up, got him going and everything has just been perfect for the past 30 years. He claimed this was the first time he was feeling pain, and assured me it was because his old dentist, who was simply excellent, had retired. Then he explained he was trying out the different dentists in the area to find a perfect fit for his future oral healthcare, just like he’d found for the past 30 years. Before starting I explained to him that just like any other emergency appointment, we’d do what we could to get him out of trouble but this was by no means a thorough examination. We’d carry out some x-rays to assess and make a diagnosis. Essentially, I would be explaining what was happening in his mouth and what the problem was. Based on this understanding of the problem and the consequences, he would be deciding on how he wanted to proceed, and we’d support him in that. That’s our philosophy with every patient, and John was fine with that. Once he opened his mouth, what I discovered was actually quite shocking. Every tooth in his mouth, including his front teeth, had been filled and overfilled multiple times, to the extent that some of the fillings now made up about 90% of the tooth structure! As soon as I saw that I knew I’d have to ask him a few questions to find out what exactly happened over the past 30 years. John described how whenever he wanted to see his old dentist, he’d always been extremely booked out and John would only get an appointment 2-3 weeks after ringing. During his visits he’d get as many fillings as possible – this would typically be six to seven fillings within a period of 30-45 minutes. He’d then be on his way feeling perfectly content because he would have spent a minimal amount for perfect-looking fillings, to the tune of $200 per tooth. He’d seen a few other dentists at the time, all of whom suggested getting crowns, ceramics or some other advanced treatment for his teeth. He figured they were simply trying to rip him off and stuck to his old dentist. Coming back to his teeth – on the upper right side he had massive swelling in his gums, and was actually leaking some pus through a little hole called a sinus tract into his mouth. He complained of some foul smell and bad taste in his mouth as well, so we did an OPG, or a full mouth x-ray, took some photographs, then I set him up to explain what had actually happened over the past 30 years. I started by assuring him that I had no intention of trying to sell him anything, I didn’t want him to do any crowns, root canals, implants, or anything whatsoever. All I wanted him to do was understand what was happening in his mouth so as a basic starting point he could be free of infections and have a healthy mouth. What had actually happened to John in his 30 years with the lovely dentist he had been seeing regularly was that his trustworthy dentist had been treating John with what we call supervised neglect. Now supervised neglect is a complex term used in medical/legal circles, I’ll give you a typical scenario where supervised neglect has taken place. If you’ve entrusted your oral or medical health, or anything similar, to a health practitioner, and they assure you that everything’s fine so they can continue doing what they think is right while your condition actually worsens – that’s supervised neglect. In dentistry, supervised neglect is if the dentist fails to inform the patient of the condition or explain the consequences sufficiently, recommends and provides treatment he/she thinks is right just to keep the patient returning for more services over an extended period of time. Keep in mind that the treatments provided may not actually have been appropriate for the patient. In John’s case, supervised neglect had led to his teeth being filled and overfilled to a point where the nerves in most of them had become necrotic (died), leading to abscesses in his mouth. These abscesses were now draining into large areas in his jawbone and had caused the development of multiple infections in the bone. The thing about chronic infections, such as this local infection in the jaw, is that they can slowly and painlessly keep getting worse without any symptoms. This is why a lot of people, like John, think there’s nothing to worry about. As far as he understood the situation as a patient, he had not previously been in any pain and no pain means no problem. However, that’s not always the case when it comes to healthcare – no pain doesn’t always mean no problem. The only reason John decided to come in to see me was that his chronic infection had flared up into an acute abscess, and even then all he thought he needed were antibiotics to tide him over. Unfortunately, that’s all he’d been doing on multiple occasions with his old trusted dentist for the past 30 years. Each time such a situation arose, he’d simply take four to five courses of antibiotics, and the pain and swelling subsided. His dentist had never recommended any other complex treatment. Once I explained everything to John, and once he saw the x-ray for himself, he saw the light and realised just how serious his situation was. I referred him to a specialist orthodontist for a thorough assessment, and let him know that fixing everything was probably going to cost him around 40 thousand dollars. He’d have to be prepared for that unless he was fine with losing all his teeth for life. This was one of the more interesting incidents of supervised neglect I’ve come across at my practice, so I thought I’d share it on my blog. Hopefully this helps a lot of you understand that this is something you can’t take lightly. Always get regular assessments done, make sure you visit a dentist you can trust and who knows what he/she is doing, is proactive and not simply reactive to your dental problems! 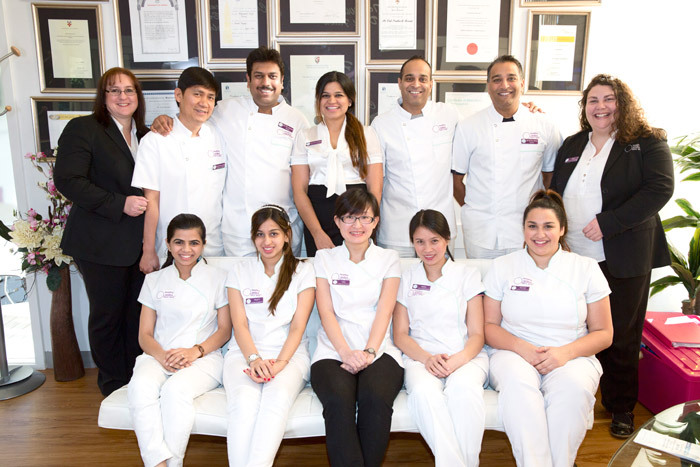 If you’re unsure how to go about finding a trustworthy dentist or have any questions feel free to give us a call on 03 9877 2035 or email us at info@healthysmiles.com.au. You can make an appointment for a free no-obligation assessment at our practice with one of our experienced dentists, and we’d be more than happy to answer any of your questions. « Implant Dentistry – Screw It or Not?